Multilingual support for business websites with the potential to greatly reduce expended cost and time. 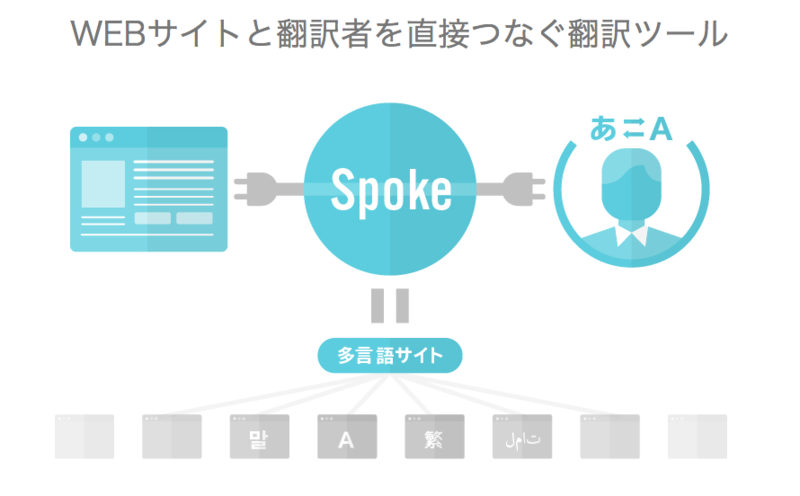 huddle Co., Ltd., which handles cross border electronic commerce and the production of multilingual web products, (Headquarters: Kamisu City, Ibaraki Prefecture, Japan; Representative Director: Atsushi Kawamata) will begin offering the beta version of its Spoke (https://spoke.cloud) service, a tool for assisting in human translation that directly connects websites to translators working in 36 languages. In 2015, the number of people visiting Japan climbed to a record high of 19,740,000. Additionally, the government has announced goals for significant increases in tourism, to 40 million in 2020 and 60 million in 2030. However, due to a lack of foresight, human resources, and know-how, most websites that offer information to visiting tourists have not been made multilingual. This has become one of the main causes of dissatisfaction for those visiting Japan. Furthermore, a large number of instances have occurred in which damage has been done to a brand or information has not been sufficiently communicated due to poor translations or errors in translations that were carried out by machines. Spoke automates the translation process by connecting native speakers of 36 languages through a CMS (Content Management System). Spoke can translate content that is difficult for machines to handle, and it can do so at a rate of five yen per character. It works at any time, 24 hours a day, 365 days a year. By automating the creation of HTML, and thus rendering the previously prohibitive costs of HTML production unnecessary, the total cost of creating a multilingual site can be reduced by more than 1/3. Furthermore, Spoke makes it possible to dramatically reduce the amount of time between submitting a request and posting the finished translation. For example, in most cases, content including 800 characters of text can not only be translated but also posted live as HTML within 3-6 hours of the original request. The beta version of Spoke supports the WordPress platform, and in the future Spoke will support other CMS (Content Management Systems). Cost: Five yen per character (in the case of Japanese). Installable CMS: Word Press (others will be introduced sequentially). Installation Method: Plugin installation and API settings. 1. Search Engine Optimization: Using an individual domain or different URLs depending on the language, Spoke takes SEO into account. 2. Translation Cost Optimization: Translation prices from five yen per character. 3. CMS Optimization: Beginning with WordPress, a variety of CMS can be easily integrated through a simple interface. ・Translation into many languages of news updates and investor relations material for corporate websites. ・Translation of hotel, restaurant, and other tourism related websites. ・For manufacturers, translation of the information pages for exported products. ・Translation of explanatory pages for products involved in cross border electronic commerce. Company Name: Alleyoop Co., Ltd.
Company Name: huddle Co., Ltd.